Yesterday, I held a bit of magic in my hand. Magic that connected me back through thousands of years of history and a sacred and fragile bit of today’s world. All of this was handed to me at the premier Mexican folk art festival: Feria Maestros del Arte, held every mid-November on beautiful Lake Chapala, Mexico. Purple has long been coveted as a color of beauty and a sign of royalty and wealth. The wearing of purple was often forbidden by sumptuary laws intended to regulate and reinforce social hierarchies. Interestingly, for as highly as it has been valued throughout history, the discovery of purple dye seems to have come from the whims of accident. Early dye makers crushed the snails to extract the dye and it is reported that it took 10,000 shellfish to dye the hem of a garment. 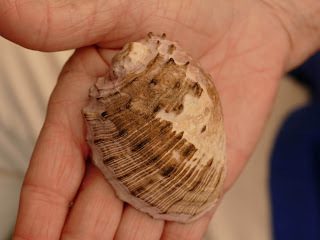 Today’s natural dye makers, tintoreros in Mexico, have a much more difficult and dangerous job of humanely gathering purple dye from the caracol púrpura, a snail that lives amidst crags of the rocky coast from Baja, Mexico to Peru. 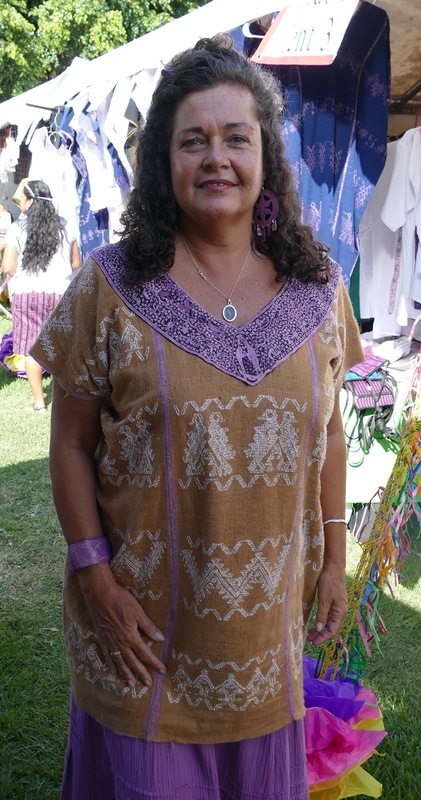 Among the Mixtecs, in the Mexican state of Oaxaca, there is a thousand-year-old tradition of obtaining the precious purple tint of a marine snail called purple pansa. 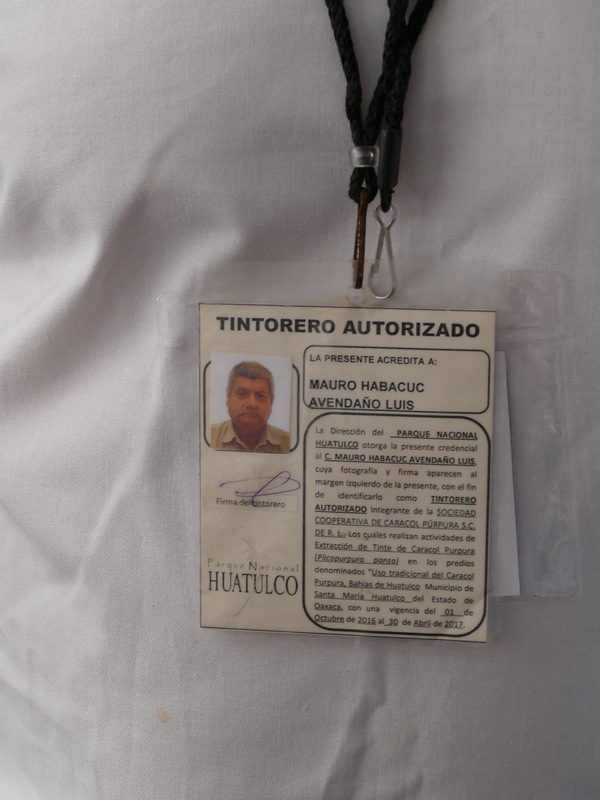 That snail was the magic that I held in my hand yesterday as I listened to Don Habacuc Avendaño, one of the 15 remaining tintoreros in the world who knows how to gather the precious dye. He described how he “milks” the snails, 300 of them, in order to dye one skein of yarn. From his village, Pinotepa de Don Luis, he travels to the rocky shores, gently removing one snail at a time with a special wooden stick designed to not injure the snail. With a white cotton skein in one hand, he blows on the snail to make in first release its urine and then the milky ink which will turn purple as it dries in the sun. Then he returns the snail to its rock and loosens the next one. One after another, he milks 300 snails to dye one skein. As Patrice Perillie, Director of Mexican Dreamweavers, continued the story of the many hours it takes to hand weave (on a back strap loom) a huipil (traditional tunic-like blouse) or rebozo using this sacred dye, I felt a little overwhelmed wearing the precious garment I had purchased the day before. 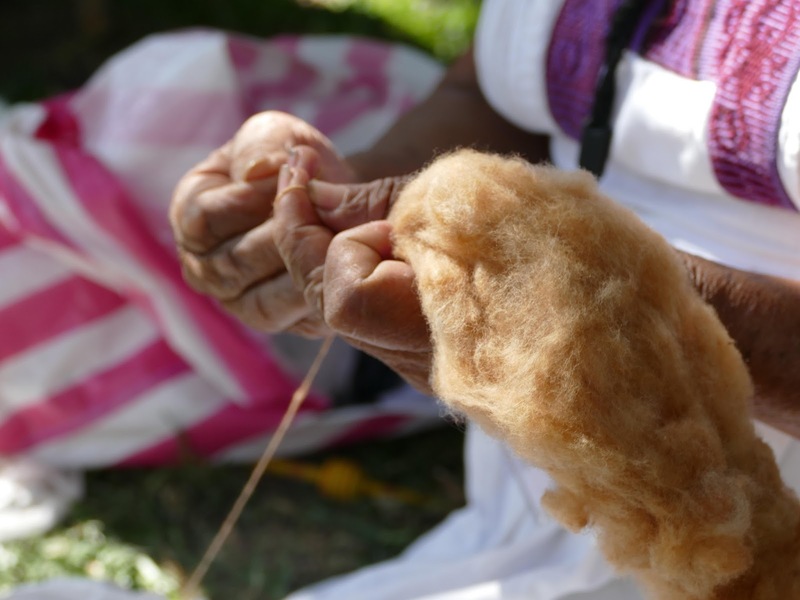 Note: also at the Feria, there was a woman spinning rare brown cotton as well as a few garments made from it. 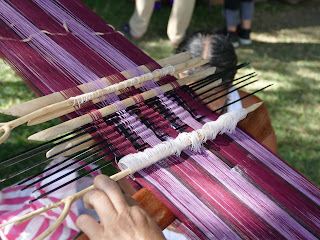 Rare brown cotton being spun into thread. It is humbling to even try to compare the hours it took me to earn the money to pay for the huipil to the hours, days and months it took to spin and dye the yarn and then weave and embroider the cloth, to say nothing of the knowledge and skill of generations of craftsmanship involved. Unfortunately, all of this is now endangered. Years of poaching and extreme demand for the dye has driven the magical snail to the brink of extinction. The indigenous art of weaving fabric on back strap looms is also endangered by modern commerce and the availability of cheap fabrics. 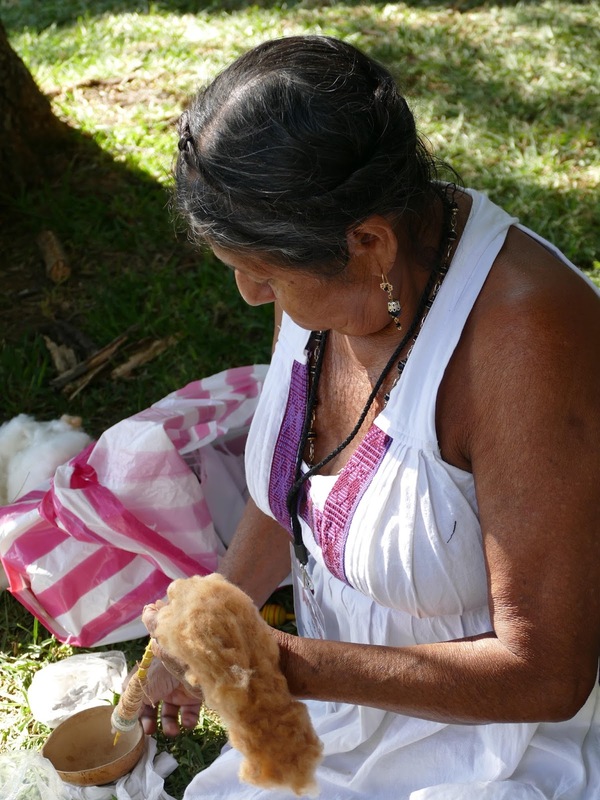 A fascinating video featuring Don Habacuc Avendaño and his sister, weaver Margarita Avendaño is offered on Facebook: Mexican Dreamweavers, videos. 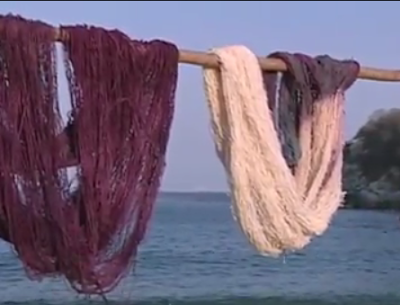 Subtitled in English, the video shows how the dye is gathered and woven into cloth. Don Avendaño explains the hazards of gathering the dye and the challenges of making a living in the tradition that has been handed down for generations. If you would like to know more about how to support this project, please contact Patrice Perillie at mexicandreamweavers@hotmail.com. 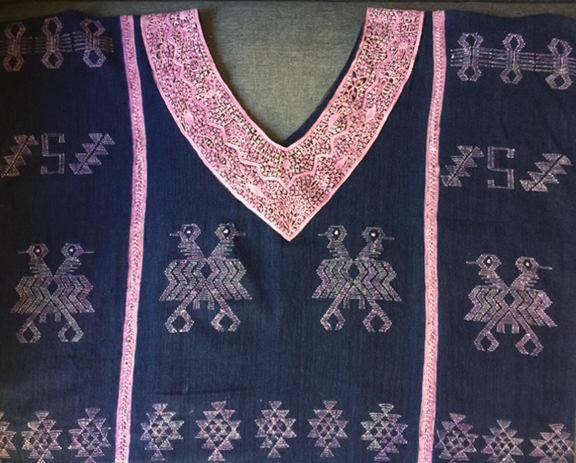 Also of interest, Tia Stephanie Tours offers a “Textile Traditions Oaxaca: Coast & Isthmus & Chiapas Highlands” for 2018. The snail’s dye does not require a chemical fixative. When Don Avendaño first began working as a tintorero, they could gather food where they worked on the beaches: fish, iguanas, turtle eggs, clams. Now, he says, the wildlife is gone. In the mid-1950s, when he started gathering dye, there were four times more snails than today. Now there is a national park protecting the snails and tintoreros have to be authorized.